PUNCH IN CANADA.- We congratulate our lachrymose friends on the appearance of this antidote to melancholy, the first number is right good. We wish him full success. 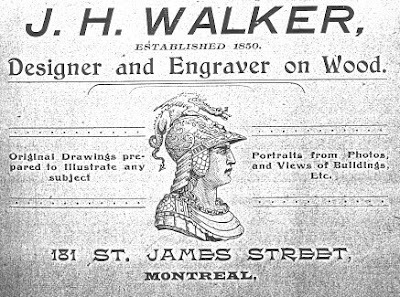 John Henry Walker, publisher, engraver and caricaturist, was born in Ireland in 1831 and emigrated to Montreal in 1842. 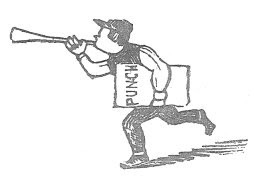 On New Years Day in 1849 Walker published the first number of Punch in Canada. It was the Dominion’s first comic journal. Walker designed the cover and engraved a full-page cartoon (“cut”) for each issue. The price was four pence a single copy, 7s. 6d for a yearly subscription. 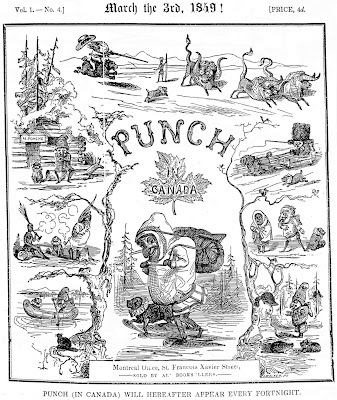 PUNCH IN CANADA.- This satirical and funny old dog has arrived in Canada and taken up his abode, permanently we hope, in the good city of Montreal. We have received the first number of the publication, it is decidedly superior to anything of the kind that has ever been published in Canada. The illustrations are very good, and the periodical is certainly well got up. PUNCH IN CANADA.- The illustrations are very good. The wit will probably be found too pungent for some people. The best plan is for them to laugh at themselves. 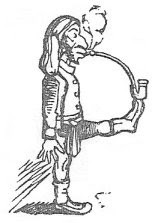 Punch, while battling stoutly at humbug, says he will belong to no party. -Quebec Gazette. 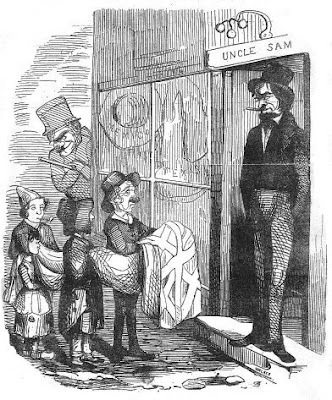 Walker drew the covers using the British Punch figure designed by John Leech. Punch was seen walking on snowshoe through a forest of pine trees accompanied by his harlequin dog. He wears a Hudson’s Bay Company parka, carries a hatchet on his belt and shoulders a backpack and was surrounded by vignettes. The cover changed over time and the vignettes showed the Punch figure sitting on a log in front of an habitant’s cabin smoking a clay pipe ; wooing a native woman, shooting buffalo on horseback, riding a sleigh and paddling a canoe, sharing a pipe with Indians, and conversing with racoons. The one large cut each issue consisted of a political comment by Walker. They were crude drawings but had a rough power. 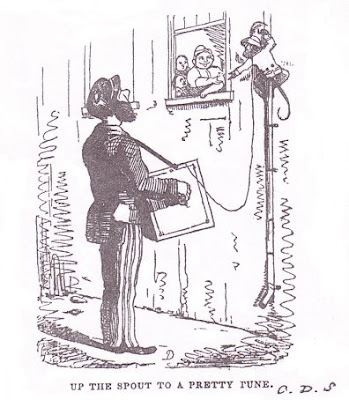 One effective cartoon was titled ‘The Prisoner of Monklands, (Suggested by “The Prisoner of Chillon.”)’ Walker was not the sole cartoonist, a man named Matthews drew some single-panel caption cartoons, others were signed simply with initials, such as ‘D’ and ‘FL’ The editors and authors of the text and poetry were also anonymous. THE GOVERNORS VISIT TO THE PUNCH OFFICE. It is not generally known but now it will be, that His Excellency the Governor General expressed a desire to visit the establishment of Punch in St. Francis Xavier street, and accordingly the talented boy who presides over the complicated affairs of that wonderful establishment, received a note from the Attorney General East, which on being translated to him by the renowned “Dolly” overwhelmed him with the announcement that His Excellency would drop in on the following day : unless he should on his way down, drop in some of the holes in the streets so obligingly provided for the disappearance of pedestrians by our energetic Corporation. Our indefatigable boy instantly began his preparations for receiving the illustrious visitor. The whole of our extensive frontage was swept at an early hour, and before the Big Bell of Notre Dame had sounded six o’clock, our extensive mat was well beaten against the Seminary wall. The boy with an axe and shovel proceeded to remove the snowy incrustations bestowed upon the doorsteps by the liberal hand of nature, and every thing was done by that precocious juvenile to confer honor on the Representative of Royalty. The interior of our premises presented a very elegant appearance; the whole of the walls were covered with beautiful full length portraits of ourselves in our various costumes, and with posters got up with every desire to attract public attention, while the counter which had been vigorously scrubbed, presented an unbroken although dilapidated appearance of painted deal. In order to give an appearance of extent, our letter box was thrown entirely open, thus showing as far as eye could reach, an uninterrupted view of our interior. A special cabman was sent to some of our principal contributors, who however, not having cash or debentures to pay the fare refused to attend. Our artist was a noble exception to this discourteous behaviour. He immediately LOCK’D up his studio, put the key in his pocket, and, not caring whether the cab was paid or not, obeyed our summons; having first put on a clean collar, and carefully turned it down for the occasion. The grey headed Editor instantly had a game of leap frog with the counter and received the Governor at the scraper, while the boy, pocketing the four pence, made a graceful obeisance. The scene at this moment was particularly grand ; but as description must fail to impart an idea of its sublimity, we shall refrain from entering into further particulars. On the entrance of His Excellency, a procession was formed in the following order. Supported on each side by several pages of our publication. The grey-headed Editor then announced that a cold collation was spread in the wood closet ; but as he had previously uttered a bad joke, a gloom had been thrown over the party and the procession evinced a desire to move off. The crowd outside the office manifested their loyalty by calling a sleigh ; His Excellency and Mr. Attorney General East instantly slipped into it and slid away. Bearing the Till minus the Maintenance. The Boy has not been heard of since. *Punch is sorry to add that he has since been informed that a notorious character named “Papineau” has willfully destroyed this cherished document. 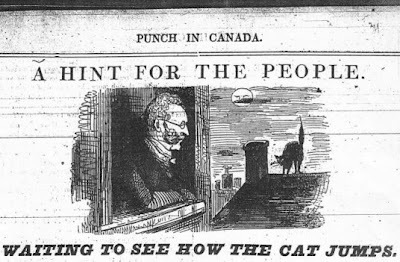 In 1850 PIC publishing was moved to Toronto where the publication folded after one year. Walker went on to found the comic journals Diogenes and Grinchuckle. Other work appeared in The Dart, Jester, The Canadian Illustrated News and L’Opinion Publique. Walker may very well have been the originator of the legendary Johnny Canuck. Walker was a master designer and wood-engraver and engraved much of the output of Montreal publisher John Wurtele Lovell, known as “Book-A-Day” Lovell, who published seven million cheap books a year. Walker died in 1899 in Montreal.